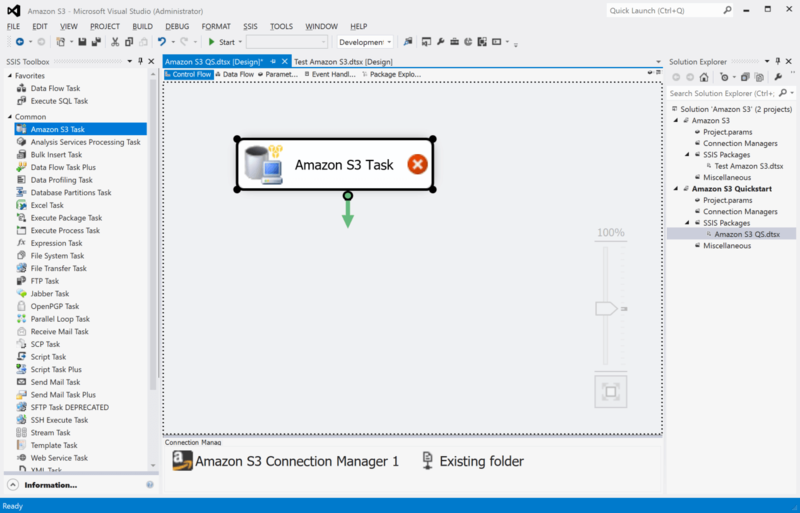 The Amazon S3 Task is an SSIS Control Flow task for sending and receiving files to Amazon S3 service. 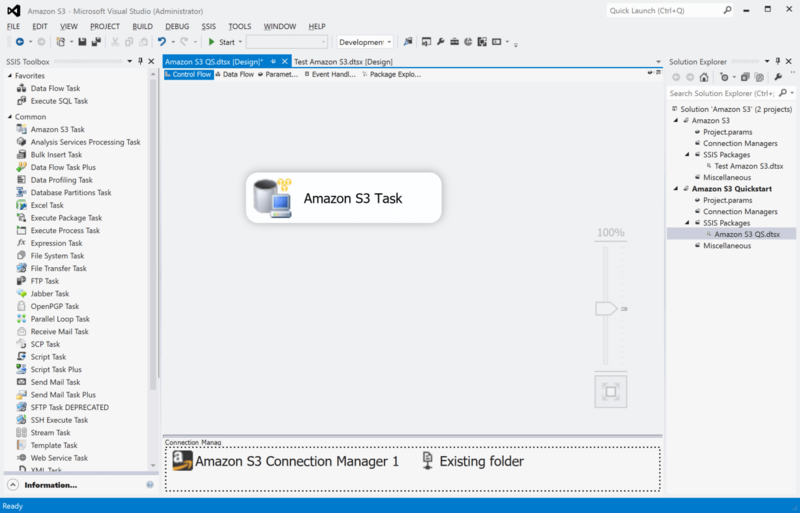 In this section we will show you how to set up an Amazon S3 Task to receive a file. Before you begin, configure an Amazon S3 connection manager and a connection manager for the local folder. The name(s) of the file(s) downloaded from Amazon S3 will be used as the local name(s) so do not specify a path that includes a filename in the connection manager. In this example, we are using a File connection manager to specify a path to an existing folder. 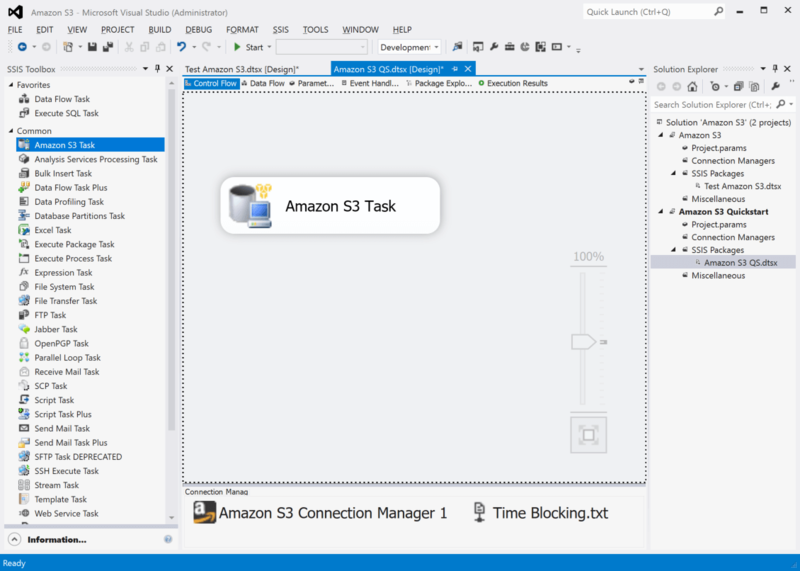 Drag the Amazon S3 Task from the SSIS Toolbox to the Control Flow canvas. Double-click on the task on the canvas to open the task editor. Once the task editor opens, select the Action you wish to perform (Send files, Receive files, Remove remote files, Get remote files list, Rename remote file, Create remote directory, Remove remote directory). In this example, we will choose Receive files. For the Local parameter, choose either a Flat File or a File connection manager. In this example we’re using a File connection manager named Existing folder which points at a local path (C:....\Diane's Files\Amazon S3 Files). For the AmazonS3Connection parameter, choose the Amazon S3 connection manager you already set up. For the Remote parameter, specify the path to the file to be downloaded from Amazon S3, starting with the name of the bucket. In this example, the bucket name is “coldestdayinschaumburg”. Click OK to close the task editor. Congratulations! You have successfully configured the Amazon S3 task to receive a file. Use the General page of the Amazon S3 Task Editor dialog to configure the parameters needed to send and receive files. Send files Sends a file. Selecting this action displays the dynamic parameters IsLocalVariable, Local, LocalVariable, ContentType, AccessPolicy, IsLocalFilterVariable, LocalFilter, LocalFilterVariable, AmazonS3Connection, IsRemoteVariable, Remote, RemoteVariable. Receive files Receives a file. Selecting this action displays the dynamic parameters IsLocalVariable, Local, LocalVariable, AmazonS3Connection, IsRemoteVariable, Remote, RemoteVariable, IsRemoteFilterVariable, RemoteFilter, RemoteFilterVariable. Remove remote files Removes a remote file. Selecting this action displays the dynamic parameters AmazonS3Connection, IsRemoteVariable, Remote, RemoteVariable, IsRemoteFilterVariable, RemoteFilter, RemoteFilterVariable. Get remote files list Gets a list of remote files. Selecting this action displays the dynamic parameters ResultVariable, AmazonS3Connection, IsRemoteVariable, Remote, RemoteVariable, IsRemoteFilterVariable, RemoteFilter, RemoteFilterVariable. Rename remote file Renames remote file. Selecting this action displays the dynamic parameters AmazonS3Connection, IsOldNameVariable, OldName, OldNameVariable, IsNewNameVariable, NewName, NewNameVariable. Create remote directory Creates remote directory. Selecting this action displays the dynamic parameters AmazonS3Connection, IsRemoteVariable, Remote, RemoteVariable. Remove remote directory Removes remote directory. Selecting this action displays the dynamic parameters AmazonS3Connection, IsRemoteVariable, Remote, RemoteVariable. Contains the local path or Stream object. Select an existing user-defined variable, or click <New variable...> to create a new variable. Specify the content type of the uploaded file. Select the access policy of the uploaded file. This parameter has the options listed in the following table. Private The file is not available for access from users other than the owner. Public-read The file is available for read by anyone. Public-read-write The file is available for read and write by anyone. Authenticated-read The file is available for read only by authenticated users. Select an existing Amazon S3 connection manager, or click <New connection...> to create a new connection manager. Select a bucket from your Amazon S3 account. DEPRECATED: No longer used. The bucket is now part of Remote parameter. Indicate whether or not the remote name is stored in a variable. This parameter has the options listed in the following table. True The remote name is stored in a variable. Selecting this option displays the dynamic parameter RemoteVariable. False The remote name is specified in a File connection manager. Selecting this option displays the dynamic parameter Remote. Indicate whether or not ResultVariable contains an array of file names or extended file information. This parameter has the options listed in the following table. False The ResultVariable contains an array of file names. Where can I find the documentation for the Amazon S3 Task? Fixed: Failed with error "Index was out of range. Must be non-negative and less than the size of the collection." (Thank you, Carl). New: A new ExtendedRemoteFileInfo parameter to retrieve extended file information: size, last modified, etc. New: A new 'Rename remote file' action. New: A new 'Create remote directory' action. New: A new 'Remove remote directory' action. New: A new parameter RemoteFilter to set remote file filter expression when using ‘Receive files’, ‘Remove remote files’, ‘Get remote files list’ actions. New: A new parameter LocalFilter to set local file filter expression when using ‘Send files’ action. Fixed: Failed to process files containing space in name (Thank you, Steve). Fixed: 'Get remote files list' action returned only the first 1000 files in a bucket (Thank you, Bob).